Vintage style is a favorite source of inspiration for designers, and can be seen in type, illustration and web design anywhere you look. As the decades progress, “vintage” takes on a different meaning. The 1930’s is one of my favorite eras, and features pioneers of many of the typefaces, technologies and art styles we appreciate most today. Launch Photoshop and click on “File > New > Document.” Give your document a name and choose the “Web” preset. I selected “1600 x 1200? for the Size, but you can choose whatever size you like. Set a vertical guide by clicking on the left ruler and dragging the guideline to the 800px mark on the top ruler. Repeat to set a horizontal guide, dragging a guideline from the top ruler down to the 600px mark of the left ruler. This gives you a general guideline for where center is. Guides can be turned on and off using Cmd+; (MAC) or Ctrl+; (PC). Choose the Bucket Tool and set your foreground color to black. Fill the document so your first layer is completely black. Ensure your Layer panel is visible and create a new layer. Choose the Ellipse Tool by right-clicking on the Rectangle Tool in your left toolbar. Set the foreground color to white and draw a medium-sized circle in the center of your document. Don’t worry if it is not perfectly centered, but try to make it as perfect a circle as you can. 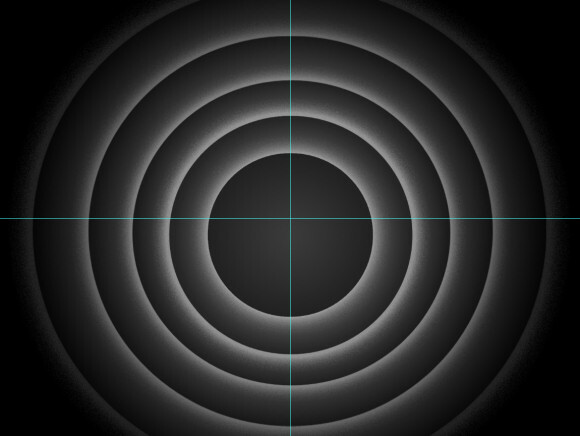 Use the Move Tool to reposition the circle about 2/3 below the horizontal line. Center the circle by lining up the center nodes with the vertical guide. 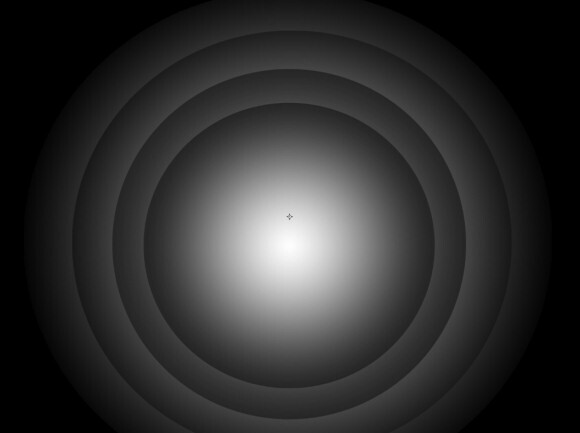 Double-click the circle layer and select the Gradient Overlay. Choose “Radial” from the Style menu and. check “Reverse” Reduce the Opacity to about 85%. Right-click the circle layer and choose “Duplicate Layer.” Click on the original layer, which should now be below the duplicate. 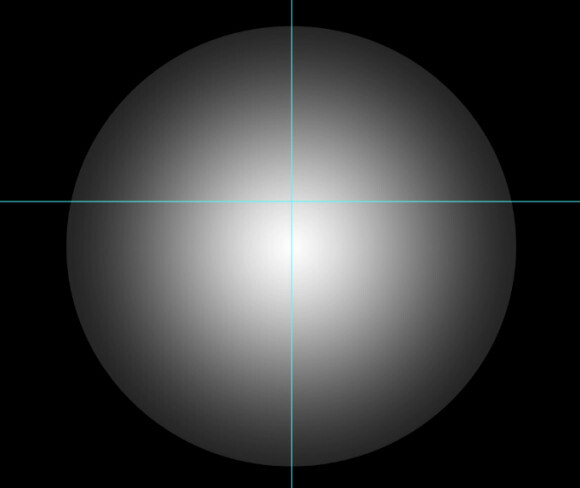 Use the Move Tool to expand its diameter until it is about 200 pixels larger than the second circle. Double-click the layer and change the Opacity to 100% and the Scale to about 120%. Click the top-most circle layer and create a new layer, which should now be on top. 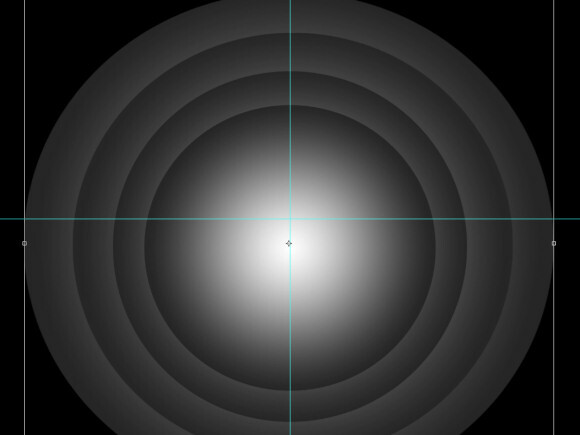 Set the foreground color to #151515 and use the Ellipse Tool to draw a small “hole” in the center of your rings. Use the Move Tool to scale and position it until it is centered and of a balanced size. Reduce the layer opacity to 85% to give it a little dimension. Double-click the “hole” layer and select “Outer Glow.” Click the color swatch and choose a slight off-white, such as #f1f1f1. Increase the size to 54px, Spread to 2%, Noise to 15% and Opacity to 50%. 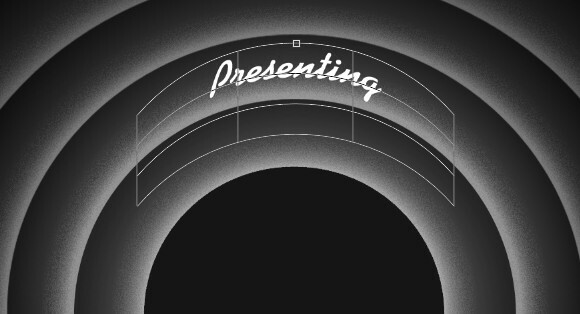 This gives the surrounding ring a contour while the noise adds a bit of a vintage film feel. 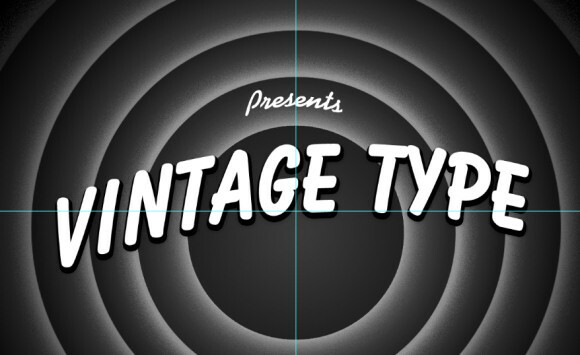 This is the primary effect you will use to create the “film barrel” illusion that was popular in vintage intros. Apply this effect to the other circle layers, varying your Size, Noise and Opacity to get the desired look. As you can see in my example, the outer-most ring uses a lower opacity to make it appear farther away from the light source in the center. Set your foreground to white. 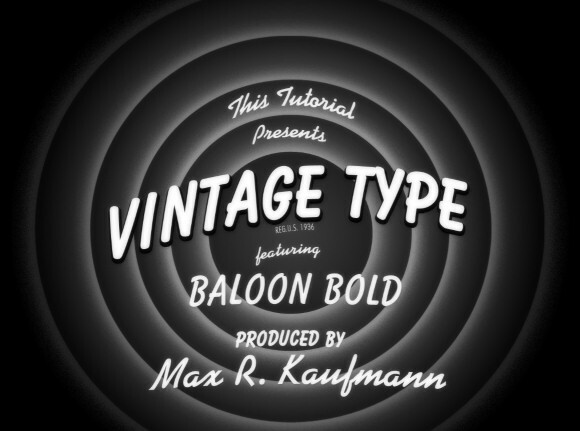 Choose the Text Tool and set your font to Kaufman Bd BT, 60pt, centered. Add your “Presents” text above the hole, and position it within the first ring. Click the “Create Warped Text” button in your Text Options Toolbar and select “Arch” from the Style menu. 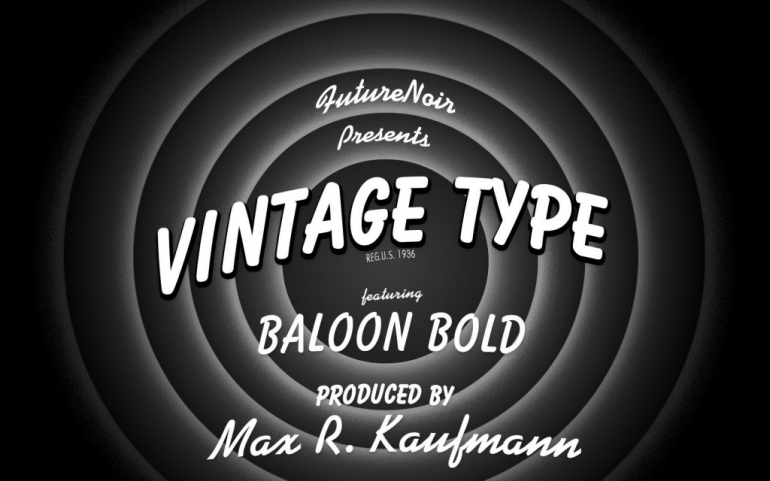 Return to the Text Tool and select your Balloon or Bazooka font. Set it to about 200pt and draw a large text box across the upper half of the hole. Type “Vintage Text,” as shown the example, or whatever you wish. Adjust the font size and text box so it fits comfortably on one line. Use the Warp technique to give this line a slight curve. Use the Move Tool and click the corner to enable your transform options. Right-click the node and choose “Rotate.” Left-click and drag to rotate the text a bit to the left. Right-click this layer and choose “Duplicate Layer.” To create the large, bold shadow, it is easier to use a second text layer than a drop shadow effect, which is a bit too limited for this look. Use the Text Tool to set this layer’s text to black. Double-click the layer and select “Stroke.” Click the color swatch to choose black, and set the Size to 9px. Select “Drop Shadow” and set the Distance to 1px, Spread to 11% and Size to 18px. This gives the edges of our new “shadow” a softer edge. In this era, film typography was almost entirely hand-drawn. As a result, alignment always had a bit of variation and was never grid-like or technical. Set the rest of your text using Balloon/Bazooka and Kaufmann as shown in the example, using the Warp and Rotate techniques to give the text that slightly hand-drawn feel. Experiment with different letter positioning to mimic various styles of the 1930’s and give your image a unique look. Add a subtle Drop Shadow effect to the text layers in the bottom half of the image, using a low Opacity around 16%. Add a final touch, the registration mark, by using a semi-narrow sans-serif font. I chose a premium font called Futura, which is another original font from the 1930s, but a free font like Miso will work just as well. Registration marks were handwritten often back then, so you could even write it in yourself, or use a handwritten font that is not too fancy.